Every wedding is unique, obviously, but Andrew and Robyn’s sticks out in my memory for being a really fun and informal one. So chilled out! It felt like the best organised house party you’ve ever been to. My day as the wedding photographer began with the girls getting ready at Robyn’s parents’ house in Looe. I always handle the getting ready part of the day with a kind of a ’fly on the wall’ approach. Robyn and her bridesmaids were awesome. Basically, I just said hi, and then got on with their preparations as I just kept snapping away. The vibe was pure fun. I certainly didn’t have to worry about them relaxing in my presence. The wedding ceremony was outside, at Kilminorth Cottages Near Looe. This is a great venue for weddings in Cornwall, featuring beautifully landscaped gardens, amazing views, an orchard, meadows, woods and a valley that runs all the way down to the coast. Such a good backdrop. 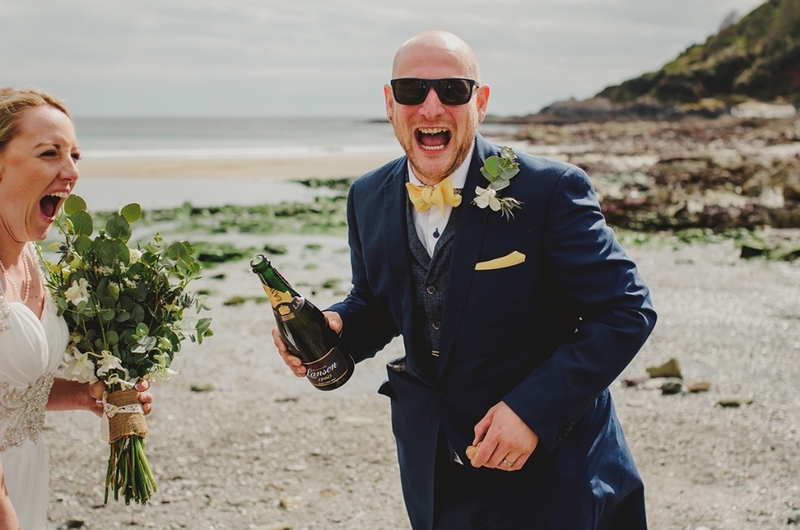 Andrew and Robyn’s guests sat on hay bales for the wedding ceremony, which featured a rousing male voice choir singing Cornish folk songs that rang out far and wide. After the ceremony I managed to get a few shots in the grounds before heading down to the beach at Plaidy with Andrew and Robyn. I knew this was a particularly special area to Robyn as it’s where she grew up, so it was really important to take some shots of two of them on the beach – special pictures with very personal significance which I’m sure they will treasure for years to come. The reception was held back at Robyn’s parents’ house, overlooking the coast, in Plaidy. There was a handmade feel to everything here, with all the decorations having nice little personal touches, and the whole occasion set in the family home. Everyone got involved and mucked in to make it extra special. Everyone made the most of this beautiful day, and got into the spirit of things – especially during the hilarious speeches! And, luckily for me, after a bit of a misty start to the day, the sun came out. This was my first wedding as photographer at Kilminorth, and I hope it won’t be the last. What a cool venue! A really laid back, rural barn-type location, situated just outside Looe and Polperro. There were plenty of lovely spots here for photographs. Everywhere I turned there were trees or greenery right there on cue. Obviously, this was a one-off private venue for this wedding, but I loved it. Just goes to show what you can achieve in your own home with a bit of care and imagination. It was pretty apparent how much work Andrew and Robyn’s family and friends put into transforming their home into a reception venue, and – hats off to them – it definitely paid off! Thank you so much for the beautiful photos!! It was so worth it going down onto the beach as well! Everybody said to us what a lovely guy and addition you were to the day. Thanks again Stewart!! Have you seen my Featured Weddings page?